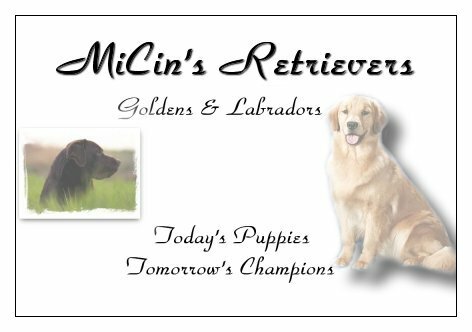 MiCin’s Retrievers is a small hobby breeder in Michigan, breeding Golden Retrievers for Conformation, as well as Labrador Retrievers for Hunting or just wonderful companions. Our dogs are evaluated and have attained all required clearances for genetic diseases before they are bred. Clearances include: OFA Hips and OFA Elbows, Eye clearance by a board certified Ophthalmologist, as well as Heart clearance by a qualified Cardiologist. All of our breedings are carefully researched to be sure they will produce a healthy and “true to the breed standard” Golden Retriever or Labrador Retriever. Just click on the above link “Our Dogs” to meet our Golden Retrievers, or Labrador Retrievers. Click on the “Puppies” Link to see the beautiful Golden Retriever Puppies, or the Labrador Retriever Puppies. You can contact MiCin’s Retrievers by clicking on the email link or from the address and phone number below. Thank you for visiting MiCin’s Retrievers, Todays Puppies, Tomorrows Champions!! !